Account Type Type of account. Default Entity Type Entities are Analytical Groups of Entity Types. They are used to assign specific accounts to specific entities. Examples of entities will be HQ and Commercial. Accounts mapped to HQ can be all corporate types of accounts (Unrealized Forex accounts, Transfer Price Margins, etc..). While the rest of the accounts that are more directly managed by the transacting entity will be under commercial. This property will then be used in the reports to split P&L between the various entities.Entities are created in the Analytical Groups Master view. Split Mode For Income/Cost of Goods Sold type of account, choose “Analytical Group” option. For operational expense type of account, choose “Cost Center” option. Balance sheet accounts should be under “None”.This will enable a sub-ledger for the accounts that will be used by the system automatically in system transactions or in Journal Entry.Sub-ledger entries become mandatory when either Cost Center or Analytical Group is selected. Enable From Enter a date when the new code can be used from or alternatively leave blank for immediate usage. Disable After Enter a date when the new code should no longer be used from or alternatively leave blank for indefinite usage. 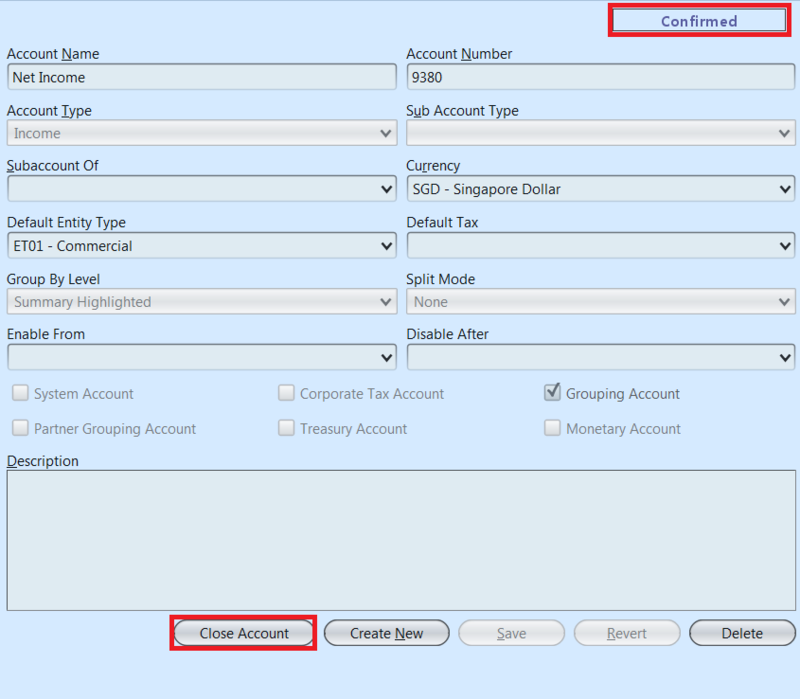 System Account Select this option to make an account reserved for system entries. This is for example when an account is reserved for the sales module and you do not want any manual Journal Entry to use this account. 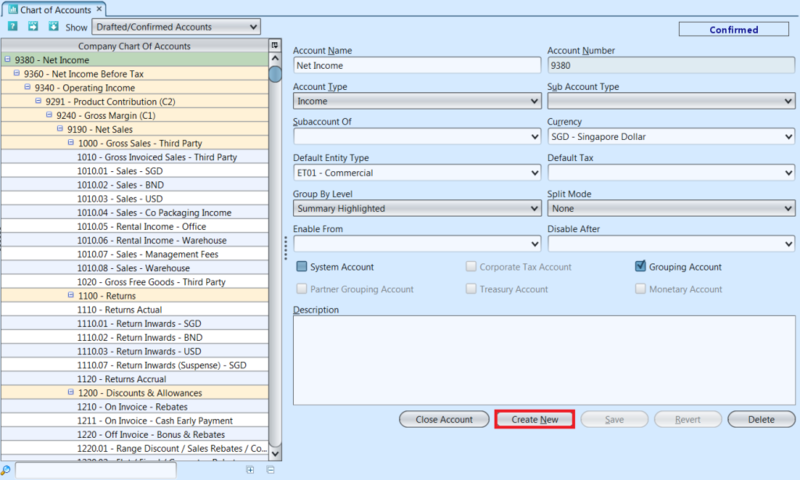 Partner Grouping Account Tick this box if the account has Business Partner (Vendor, Customer, Employee) grouped under it. 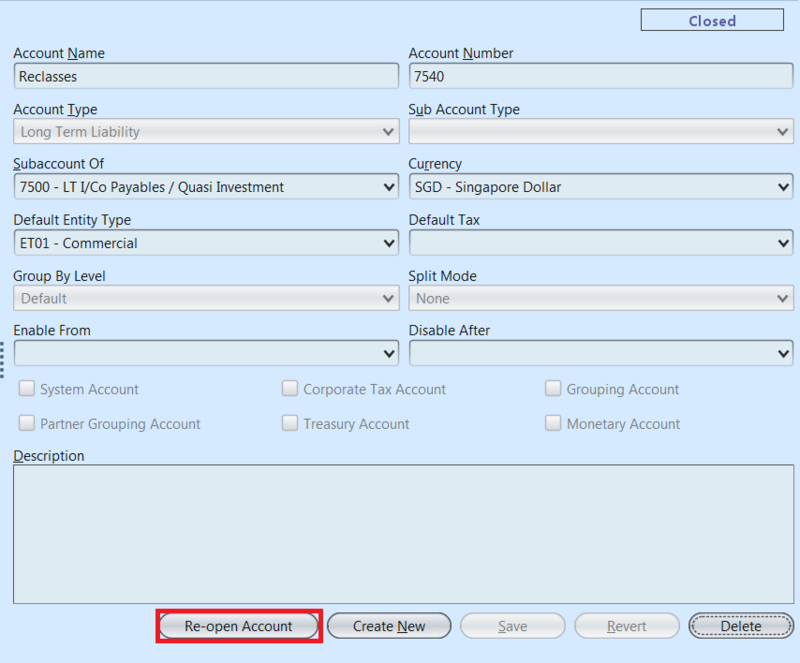 This option becomes only available if first the Account has been set as a Grouping Account. 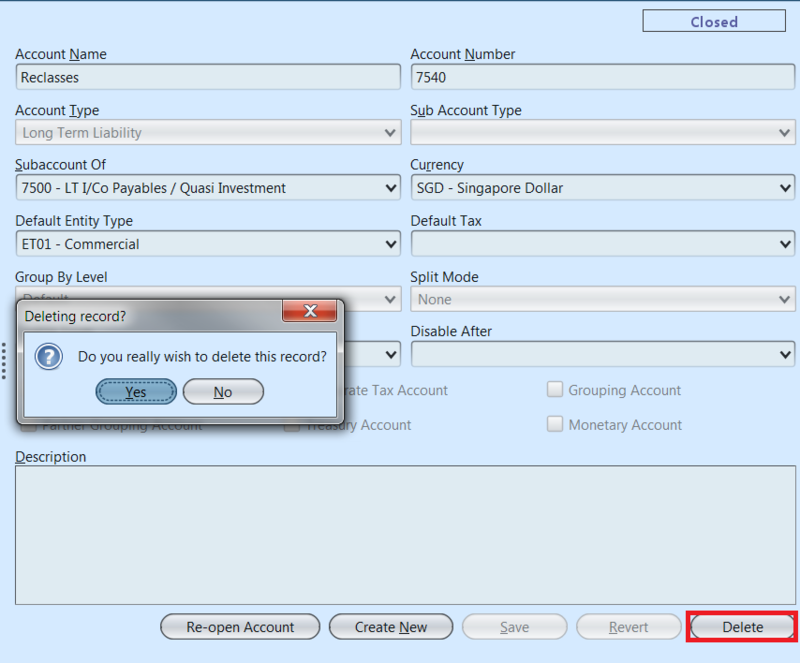 Treasury Account Tick this box if the account is Treasury account type. Treasury accounts are Loans accounts from Financial institutions, Credit Card Accounts, Factoring, etc..
Monetary Account This will be automatically selected by the system when new accounts are created.Important Note : Bank account need to be created from the Bank Account Master. A linked account will automatically be created for that Bank Account. Cash account should be created from the Chart Of Account.Monetary account type allow user to consolidate multi-currency monetary items to be translated at the current rate. Non-monetary account type (e.g. inventory, fixed assets, and long-term investments) are translated at historical rates. Please note that the Bank Account creation has to happen in the Bank Account view. 1. Select the (Confirmed) account to be closed, click on “Close Account” button at the bottom of the screen. Click on “Re-open Account” if user wants to use back the (Closed) account. By making an account “closed”, it automatically becomes non postable and will not be proposed in all accounting transactions. Please note that the system does not allow to delete an account that has been used to record transactions. 1. Enter search parameter to filter the result, i.e. type in the account name in the search text field box at the bottom of the screen.